Solar spotlights are a great tool to bring out the best of your house, but also mean a lot when it comes to your safety. No matter the reasons you choose them for, you do need to plan a bit the whole project and to do some work when it comes to installation. When you want your house/garden to look pretty at night as it does throughout the day, don’t hesitate to use some solar spotlights. You may mount wall-mount them or place them to brighten a deck/patio, so you get plenty of options. 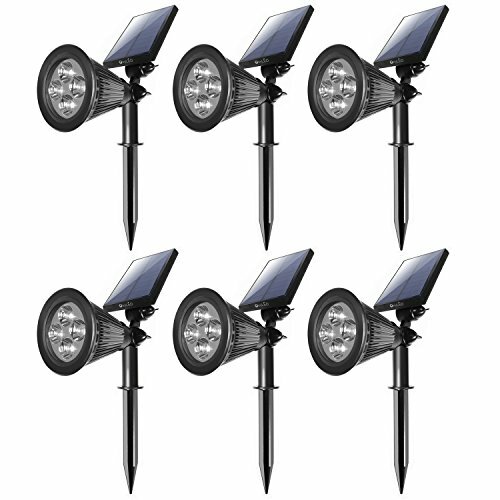 Many solar spotlights are compact and you may easily hide them behind a bush, a rock, or a flowering plant. Go for the solar spotlights with several colors of LED light so that you have more colors in your garden once the evening has come. If your residence is well lighted at night, chances are it becomes safer during the night, keeping intruders at distance. You may place the solar spotlights around doors, windows, angled low so they don’t light up directly into your home. Light up the pathways, steps, patios with solar spotlights so no one has an accident while walking in the garden. Let’s not forget the animals that (stray cats, skunks) that you don’t want around your house at night. You should choose solar spotlights that illuminate the designated area well and the size of the solar panel has a big word to say on that. The solar spotlights should be weather resistant, especially if you’re installing them outdoors, and should take a wind or a rain. You want to install them easy and for the batteries to hold their charge. Most of all, you want the solar spotlights to do their job, safety or aesthetic related. Or both. 1). 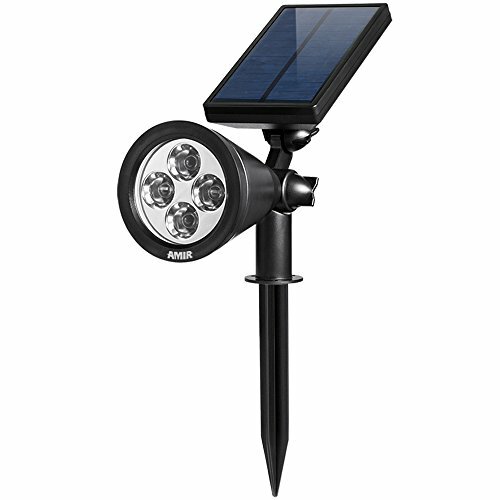 The easy setup and the nicely colored lights on the AMIR Upgraded 2 in 1 Solar Lights, Waterproof Outdoor Landscape Lighting Spotlight give you a good option to consider when you want to illuminate your residence. The spotlight gives a good 200 lumens output and presents plenty of features that explain our choice. There are two modes to use (high and low) and the LED is IP65 waterproof, so the spotlight is great for the outdoors. We also like the 180-degree adjustability of the spotlight and you may adjust the solar panel angle so that it gets the best sun exposure. The automated switch on the light means it turns on automatically at night and off once the sun has come out. You may press a button on the back of solar panel to set the high/low mode. The spotlight is versatile and you may stick it into the ground or mount it on the wall thanks to the included screws. Therefore, the spotlight is easy to install, no matter how you choose to mount it. The built-in 18650 Li rechargeable battery is efficient and holds its charge for even 10 hours. As for the colors, you may enjoy each one of them (red, green, and blue) and some consider the red to be the brightest one. The sturdy build and the nice colors make the spotlight a nice tool to use outdoors. Nevertheless, for the money you pay, the spotlight is a great choice to light up your garden. 2). 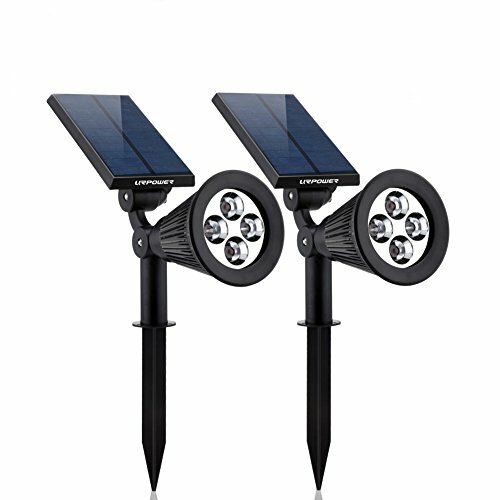 The compact design and the adjustability of the Solar Lights,URPOWER 2-in-1 Waterproof 4 LED Solar Spotlight may be the main reasons for which they are some of the most popular solar spotlights out there. 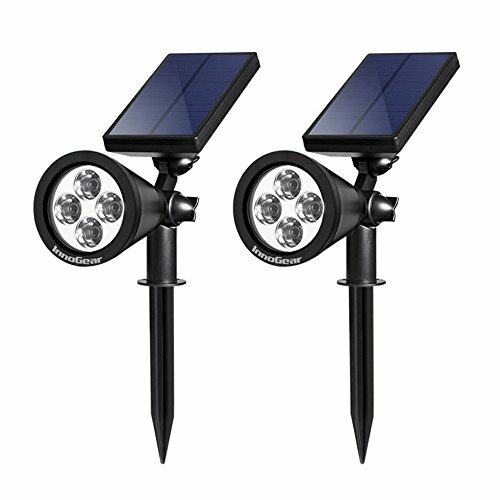 The solar spotlights are rechargeable and easy to adjust. You may wall-mount them or stick them into ground, no tools needed. You do get screws for the wall-mount, though. The adjustability of the spotlights is great and you may also adjust the solar panel so it gets the best sun exposure. You may easily set the light angle to brighten up the perfect spot. The versatility of the spotlights is another thing to mention as you may use them both outdoors and indoors. The Li-Io rechargeable battery is efficient and holds its charge pretty well. The spotlights turn on automatically at night and turn off automatically on sunrise. You get to use to use two modes (low or high) and the spotlights use 4 bright LED bulbs, providing a 200 lumens maximum output. Each light works independently. The build of the spotlights is great and they are weatherproof, presenting an IP64 waterproof grade. Made to handle the weather challenges, the spotlights have a compact design and stay bright all night long. 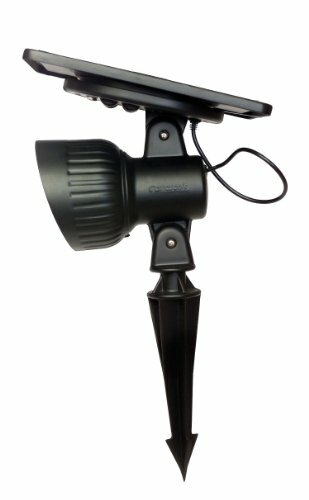 Despite the minor cons, for all the good things they bring to the table, the solar spotlights are a great option for indoors and outdoors as well. 3). 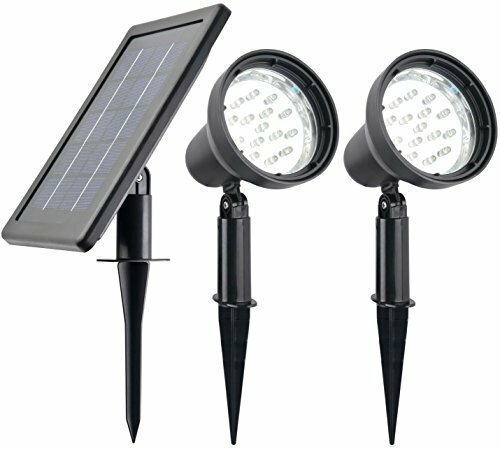 Power adjustable and dependable for so many situations, the Robust NATURAL WHITE (NOT BLUISH) Solar Spotlights are not to be missed when in need for some solar spotlights for your residence. The spotlights give a bright white light and are very well made. They’re not only waterproof, but also heat proof so the risk for overheating is minor. They work all night long and perform even in wintertime, on the right setting. The solar panel is impressively large so it gets great sunlight exposure. It’s a durable solar panel that takes the use for even 5 years. The spotlights come with big Li battery that presents protection circuit board, holding efficiently its charge. Another thing we like on the spotlights is that they’re power adjustable so you may use one of the three modes, according to a situation: low, medium or high. The spotlights are easy to install and the extension cable gives them more versatility. The light is white and the solar spotlights have a smart design, working all night long. For the versatility and smart design, the solar spotlights still stand as a reliable option when in need. 4). 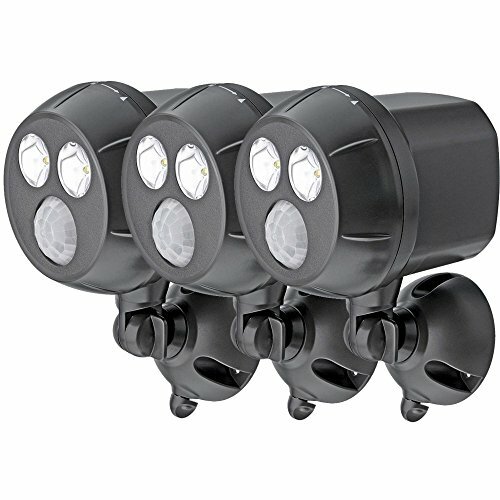 If you go for the motion activated solar spotlights, put your money at stake with the Mr. Beams MB393 300-Lumen Weatherproof Wireless Battery Powered LED Ultra Bright Spotlight. The spotlights come with bright LEDs and offer a 300 lumens maximum output. They are wireless spotlights and turn on/off automatically. The motion sensor is not too sensitive though and the spotlights are a great choice for the outdoors. The dual LED spotlight is weatherproof and seems to be durable, taking the use for a long time. It’s very easy to install the spotlight and you don’t need any wires or electrician. It comes with the hardware you need for installation. The spotlight has a good coverage area as well and each LED light ensures 400 square feet of coverage. The sensor is motion activated from 25 feet and the auto shut-off is every 20 seconds. The housing is good and it’s both weather and UV resistant. You may easily adjust the spotlight and rotate it 180 degrees or pivot it up/down, according to your needs. The light is bright and the battery lasts for a long time. You need 4D-cell batteries for the spotlight. Weatherproof and ensuring good light, the spotlight helps you secure better your residence at night. All in all, the spotlight is a dependable option, especially when you want to feel safer in the night. 5). The solid build and the warm light of the Gama Sonic Progressive Solar Garden and Landscape LED Spotlight are some of its best qualities, but definitely not the only ones to mention. 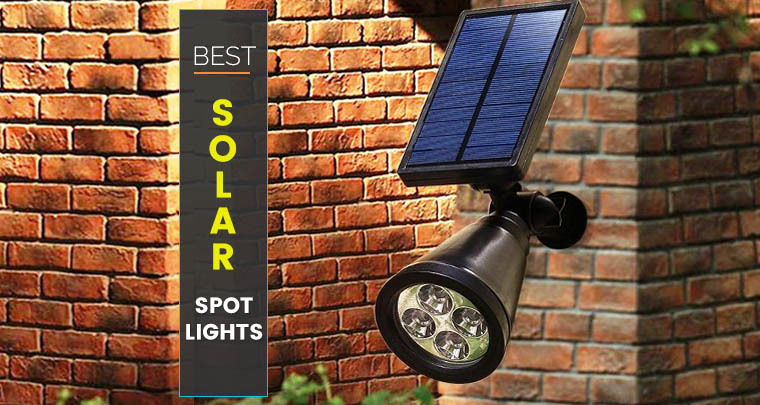 The spotlight is especially made for the outdoors and comes with a solar panel that is efficient and large altogether. Additionally, the solar panel is detachable and you may easily place it up to 8-feet away from the light, for best sun exposure. The spotlight is easy to use and turns on automatically at dusk. It charges all throughout the entire day, which explains why it stays bright for even 10 hours at night, after one single charge. The tempered glass of the panel is easy to clean and weather-resistant, for a longer lifespan. The spotlight comes with a Li-Io battery that charges well and is durable. The spotlight is made with heavy-duty aluminum so it takes the weather challenges and the use for quite some time. The clear ABS plastic lens is adjustable so you can use narrow or wide beam. You may use the spotlight for many areas, for illuminating plants, short trees, or other architectural details on your home. You don’t need electrical wiring for installing the spotlight. It comes with two mounting stakes- one for the light and one for the solar panel. The versatility of the spotlight doesn’t stop here and you may use an optional base to place the light on a flat surface. The cord is long so you may install the spotlight where you need it the most. The light has a good quality and the spotlight is reliable. Regardless, the solar spotlight is still a sturdy, good quality option than serves you well for many things. 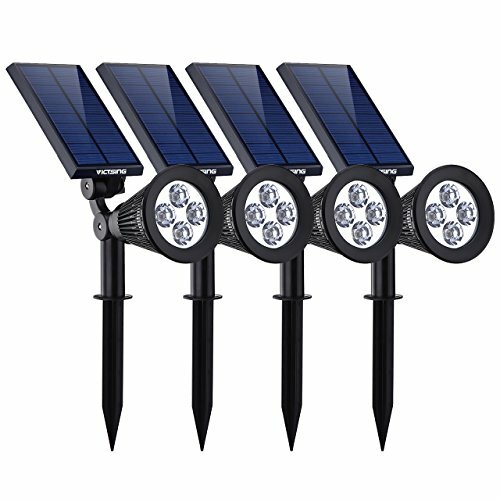 Bright and made to take the most difficult weather conditions, the InnoGear Upgraded Solar Lights 2-in-1 Waterproof Outdoor Landscape Lighting Spotlight doesn’t need a protective film and comes with many good things attached to it. The versatility of the spotlight is one to begin with and you may either mount it on the wall or stick it into the ground. If you mount it on the wall, it’s good to know the spotlight comes with needed screws. Either way, it’s very easy to install it. The automatic turn on (at night)/off (at sunrise) is reliable and saves the energy. The spotlight gives you two level of brightness, which is great. It comes with a built-in 18650 Li battery that is rechargeable and holds a strong charge. The solar panel is lightweight and easy to adjust. The light angle is easy to set it up so you can obtain the best illuminate perfect spot. You may also adjust the solar panel so it gets best sun exposure. Don’t forget to turn on the switch before use. We like the spotlight also because the light is sensitive and doesn’t light up in bright place. The spotlight presents good stability and provides output from 80 to 200 lumens. It’s great if you plan to use for illuminating your pathway, some trees or your backyard. Let’s not forget the IP65 waterproof grade that makes the spotlight safe to use on a rainy day. All in all, for the good build and weather resistance, the spotlight is still a wise buy, especially considering its price. Adjustable and made with rugged waterproof plastic, the VicTsing 4 Pack Solar Spotlights, The Third Generation 2-in-1 are worth to try whenever in need. The spotlights come with a large solar panel and monocrystalline silicon that sustains higher conversion rate. Both the light and the solar panel are adjustable so you can easily adjust light angle (90 degree) for the best illumination of the designated area. You may also adjust the solar panel (up to 180 degree) to get the best sun exposure. The spotlights also come with an automated switch so they turn on at night and off at sunrise. The light is bright and powerful thanks to the 4 pcs. of LEDS. You may set the right level of brightness as the spotlights present two lighting modes (high or low). It’s very easy to install the spotlights and you may wall-mount them or stick them into the ground. They come with the screws you need for the wall mounting. The battery charges efficiently and the spotlights may work for even 9 hours. The build is sturdy and the spotlights present an IP65 waterproofness grade. They are made with tough hard plastic and illuminate efficiently a pathway, sidewalk or your garden. Focusing on the bright side, we like the spotlights for their strong build and adjustability, not to mention versatility. Waterproof, heatproof and long lasting, the LED Solar Spotlight Outdoor doesn’t disappoint as long as you’re installing them in the right place. The spotlight has an IP65 waterproof grade and is heatproof as well, with minor risk for overheating. It’s made to last and gives a powerful 200 lumens output. You may easily use it to illuminate some pathways, a porch, a patio, or a tree flag. It’s up to you why you use it for. You may choose one of the two lighting modes (high or low), according to your needs. The spotlight automatically turns on at night and off at sunrise. It comes with a built-in 18650 Li battery that charges well and holds its charge as well. The battery provides even 8 hours run for the light on a full charge, when using the high light mode. If you go with the low light mode, the battery may run for even 16 hours. The spotlight is easy to install and try to find a place with enough sunlight. Mount the spotlight in the wall (it comes with the screws you need) or simply stick it into the ground. Whichever fits you the most. Both the light and the solar panel are adjustable and you may get a 90-degree light angle and adjust the solar panel up to 180 degrees, so it can absorb efficiently the sunlight. Easy to use, to install and to adjust, the spotlight is a dependable option to have in mind when in need. Nevertheless, for the amazing build, bright light and reliable performance, the spotlight still remains a good investment of your money.